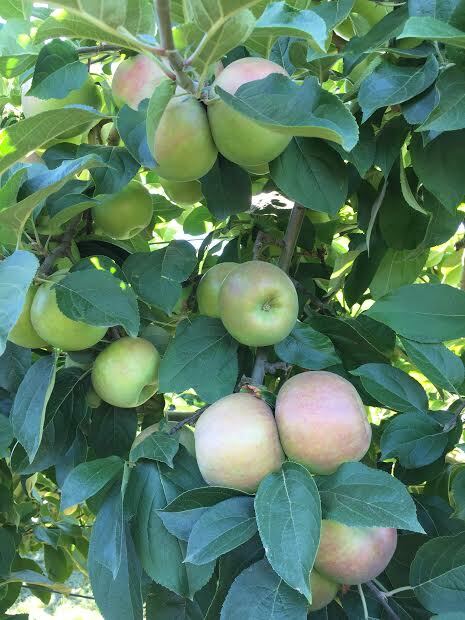 Gravenstein Apples Open Friday (Aug 4) at 8am! U-Pick Tomatoes Too! Come pick Gravenstein apples starting Friday at 8am! A heads up, last year they were all picked by noon but we think there are more out there this year so hopefully they will last a bit longer. I will send an email, post on Facebook and our blog when they do run out. After Gravenstein, we have a couple weeks of a break before Gala and Ruby Mac are ready. Gravenstein is an medium tart, old-time apple that is well known for pies, applesauce and baking. U-Pick tomatoes will also be opening Friday am! There is not enough yet to do big amount of saucing, etc but you can definitely find a some ripe out there. Come take a look when you are here for apples! We will be open Sat 8am to 12pm for tomatoes but closed Sundays until apple season gets going full speed. U-Pick blueberries are still going strong too. We will see what the heat does but we are guessing we will be open until August 12th. Aug 2-5th we are open limited hours, 9am to 12pm, due to the heat. Depending on the weather, we may go back to 9am to 4pm the following Wed-Sat.